Casa Velas in Puerto Vallarta now offers a new complimentary amenity for guests – a Sun Bar. Guests relaxing poolside at the adults-only boutique hotel or its exclusive Ocean Club can visit the Sun Bar for all their skin protection needs, from sunscreen to after-sun Aloe Vera gel and natural Aloe Vera. Guests staying in Casa Velas’ Wellness, two-bedroom Ambassador or Presidential Suites are invited to select another appreciated amenity to use and then take-home - sunhats. Forget lugging bottles of sunscreen and bending brims, Casa Velas in Puerto Vallarta now offers a new complimentary amenity for guests – a Sun Bar. Guests relaxing poolside at the adults-only boutique hotel or its exclusive Ocean Club can visit the Sun Bar for all their skin protection needs, from sunscreen to after-sun Aloe Vera gel and natural Aloe Vera. 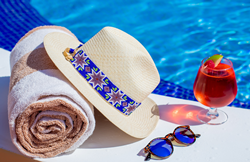 Guests staying in Casa Velas’ Wellness, two-bedroom Ambassador or Presidential Suites are invited to select another appreciated amenity to use and then take-home - sunhats. Hats for both men and women are 100% made by hand by Mexican artisans. The hats are made in a cave so that the material becomes flexible and can be manipulated. An ancestral tradition of several indigenous communities in Mexico, families gather in this cave to make hats between jokes and stories. The traditional beading is available in a variety of different colors. Casa Velas sources all designs from the local Kawitu Huichol Community. To complement the after-sun glow, guests can opt to visit the boutique hotel’s Handbag Bar, inclusive of 13 designer bags for women and Mont Blanc “murse.” Perfect to accompany a trip to town or dining in one of the resort’s gourmet restaurants, offerings range from Purificación Garcia and BCBG Maxazria to Carolina Herrera, Tory Burch, Michael Kors, and Pineda Covalin, often called the Hermes of Mexico. Casa Velas is a luxury all-inclusive boutique hotel and ocean club for adults only, reminiscent of a Spanish hacienda. The hotel features a private ocean club and is just minutes from the beach. Located just five minutes from Puerto Vallarta Airport and only 15 from the popular downtown area, art galleries and "El Malecon" (the boardwalk), the hotel features 80 spacious suites, some with private pools and Jacuzzis. Nestled on the greens of Marina Vallarta's 18-hole golf course, the hotel offers guests complimentary golf at three nearby signature-designed 18-hole courses. ABJA Spa at Casa Velas encompasses treatment rooms for singles and couples, a hydrotherapy area, garden-view fitness center equipped with state-of-the-art exercise equipment, and a beauty salon. A novel service is a handbag bar where guests can enjoy use of a "loaner" designer handbag at no extra charge. Emiliano, the AAA Four Diamond rated a la carte fine dining restaurant, is in the hands of one of the area's leading chefs serving Mexican and international cuisine. Guests can also enjoy dining privileges at the sister resort, Grand Velas Riviera Nayarit, with three gourmet specialty options as well as full access to Velas Vallarta. Forbes Travel Guide has awarded Casa Velas Four Stars, the only boutique hotel on the Mexican Pacific coast to receive. A member of SLH (Small Luxury Hotels of the World), it has been in the top two (five) in TripAdvisor for Puerto Vallarta since 2010. Casa Velas is operated by Eduardo Vela Ruiz, founder and president of Velas Resorts, with brother Juan Vela, vice president of Velas Resorts, by his side. For more information please call 1-888-407-4869 or visit https://www.hotelcasavelas.com.